Though the 993 GT2 might be known as a wild fire-breather to most, it seems one Dutchman found it a bit tame for his tastes. This monster, based off a 964 Turbo but turned into a wild 993 Evo replica, is tuned by Belgium's DUXE to produce obscene grunt and deploy it without a hiccup. Though they're a bit cagey about releasing the actual figures—this being a competitive racing car and all—it's reputed to make over 1,000 horsepower in race trim, and that makes it a dragster with the ability to brake and corner. With the propensity to spit flames, squeak between every gearshift, and some tasteful Martini-esque stripes, Jan van Es' GT2 can turn heads wherever it goes. 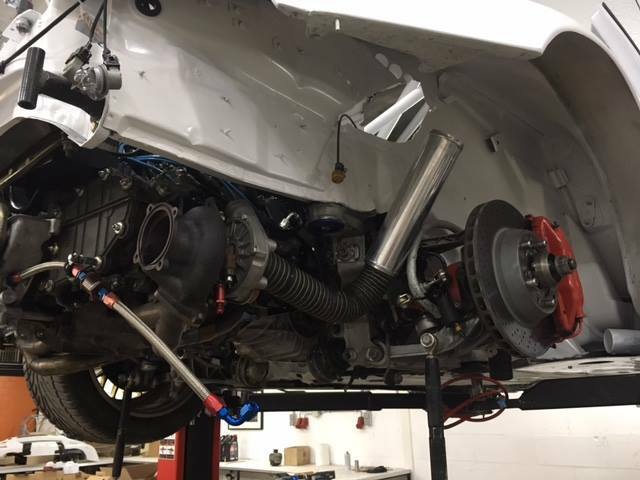 It's a club racer, and doesn't have to adhere to the strictest of regulations, and that allows it to show off the upsides of such a wild engine. Part of this Porsche's appeal can be attributed to the looks and the incredible motor, sure, but it's more than just a pretty, barely-contained dragster for the road course. Intrax suspension dots all four corners, as do modern GT3 Cup brakes, and at the rear, a rear wing stretching six feet helps plant the rear for some enviable traction. Factor in a sequential gearbox to fully exploit the jet turbines sitting underneath the rear decklid, and this beast can leave even modern RSRs in its wake. It's a Porsche that doesn't invite the driver to attack the corner entry, but rather focus on putting that remarkable power to the pavement and dragging the horizon in. Yet, it still shows plenty of stability in Zandvoort's high-speed sections, and doesn't seem like the snappiest of 991s. Considering the firepower it has, that's an amazing feat of engineering! With that 993 5-link rear suspension, there isn’t much 964T DNA left in there so it does handle like the GT-2 Evo. I liked the way Jan’s 993 GT2 just disappeared in the sunset in the straight sections. Jan knows how to drive as he apex each corner could not say that for the rest of the group at the start, but they did gain a fair bit of ground coming up to the corners, fun to watch, it would be a buzz as a passenger, a real buzz behind the wheel.